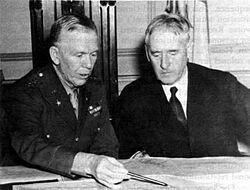 George Catlett Marshall, Jr. (December 31, 1880 – October 16, 1959) was an American military leader, general of the army, secretary of state, and the third secretary of defense. Once noted as the "organizer of victory" by Winston Churchill for his leadership of the Allied victory in World War II, Marshall supervised the U.S. Army during the war and was the chief military advisor to President Franklin D. Roosevelt. Marshall accepted appointment as U.S. secretary of state in 1947 because he wanted above all to remove the causes of war "insofar as humanly possible, and in this way make war impossible." Having helped to win the war, Marshall knew that a peace also required winning if the mistakes made in the post-World War I context were to be avoided. He recognized the great mistake of the U.S. after World War I of largely withdrawing from Europe. After World War II, the U.S. committed itself to assisting the reconstruction process, and as secretary of state, Marshll became the public face and name of the Marshall Plan, which poured massive amounts of resources into the task of repairing the shattered continent of Europe. For this effort, he was awarded the Nobel Peace Prize in 1953. According to the Smithsonian Institution, "Few Americans in the twentieth century have left a greater legacy to world peace than George C. Marshall." Marshall was born into a middle-class family in Uniontown, Pennsylvania. Marshall was a scion of an old Virginia family and a distant relation of Chief Justice John Marshall. Marshall was a cadet at the Virginia Military Institute (where he was initiated into the Kappa Alpha Order), graduating in 1901. In 1902 Marshall received a commission into the U.S. Army. Until World War I, he was posted to various positions in the U.S. and the Philippines, and was trained in modern warfare. During the war, he had roles as a planner of both training and operations. He went to France in the summer of 1917 as the director of training and planning for the 1st Infantry Division. In mid-1918, he was promoted to American Expeditionary Forces headquarters, where he worked closely with his mentor General John J. Pershing and was a key planner of American operations. He was instrumental in the design and coordination of the Meuse-Argonne offensive, which contributed to the defeat of the German Army on the Western Front. In 1919, he became an aide-de-camp to Pershing. Between 1920 and 1924, while Pershing was army chief of staff, Marshall worked in a number of positions in the U.S. Army, focusing on training and teaching modern, mechanized warfare. He was a key planner and writer in the War Department, spent three years in China, and taught at the Army War College. In 1934, then-Colonel Marshall directed the publication of Infantry in Battle, a book that codified the lessons of World War I. Infantry in Battle is still used as an officer's training manual in the Infantry Officer's Course, and was the training manual for most of the infantry officers and leaders of World War II. Marshall was promoted to brigadier in October 1936. Nominated by President Roosevelt to be army chief of staff, Marshall was sworn in on September 1, 1939, the day German forces invaded Poland, precipitating World War II. He would hold this post until the end of the war in 1945. As chief of staff, Marshall oversaw the largest military expansion in U.S. history, inheriting an outmoded, poorly equipped army of 200,000 men and, partly drawing from his experience teaching and developing techniques of modern warfare as an instructor at the Army War College, coordinated the large-scale expansion and modernization of the U. S. army into a force of over eight million soldiers by 1942 (a forty-fold increase within three years). During World War II, Marshall was instrumental in getting the U.S. Army and Army Air Corps reorganized and ready for combat. Marshall wrote the document that would become the central strategy for all Allied operations in Europe, selected Dwight Eisenhower as Supreme Commander in Europe, and designed Operation Overlord, the invasion of Normandy. His success in working with Congress and President Roosevelt, along with his refusal to lobby for the position, ultimately resulted in his being passed over as the supreme allied commander in charge of the D-Day invasion. At the time, the President told him: "I couldn't sleep nights, George, if you were out of Washington." Throughout the remainder of the World War II, Marshall coordinated Allied operations in Europe and the Pacific. He was characterized as the organizer of Allied victory by Winston Churchill. Time magazine named Marshall Man of the Year in 1944. Marshall resigned his post of chief of staff in 1945, but did not retire, as regulations stipulate that generals of the army remain on active duty for life. In December 1945, Truman sent Marshall to China to broker a coalition government between the communists under Mao Zedong and America's Nationalist allies under Chiang Kai-shek. Marshall had no leverage over the communists, but threatened to withdraw American aid essential to the nationalists. Both sides rejected his proposals and the Chinese Civil War escalated, with the communists winning in 1948. His mission a failure, he returned in January 1947. As secretary of state in 1947-1948, Marshall seems to have disagreed with strong opinions in the Pentagon and State Department that Chiang's success was vital to American interests, insisting that U.S. troops not become involved. May (2002) suggests the reason was that his first priority was to spend money on his Marshall Plan of aid to Europe. On his return in early 1947, President Truman appointed Marshall secretary of state. He became the spokesman for the State Department's ambitious plans to rebuild Europe. On June 5, 1947, at a speech at Harvard University, he outlined the American plan. The European Recovery Plan, which became known as the Marshall Plan, would help Europe quickly rebuild and modernize its economy on American lines. Truman wanted to call the plan the Truman Plan, but was warned that the plan would sink before it took off if named that. Truman thought of the idea to call it “the Marshall Plan.” The Soviet Union forbade its satellites to participate. Marshall was again named TIME's “Man of the Year” in 1948, and received the Nobel Peace Prize in 1953. As secretary of state, Marshall strongly opposed recognizing the State of Israel, telling Truman, "If you [recognize the state of Israel] and if I were to vote in the election, I would vote against you." In 1949, he resigned from the State Department and was named president of the American Red Cross. The Marshall plan's role in European reconstruction helped to pave the way for the creation of what was originally called the Common Market, or European Economic Community, which has made war unthinkable in Europe. When the early months of the Korean War showed how poorly prepared the Department of Defense was, Truman dismissed Secretary Louis A. Johnson and named Marshall as secretary of defense in September 1950. His main role was to restore confidence. On June 14, 1951, as the Korean War stalemated in heavy fighting between American and Chinese forces, Republican Senator Joseph McCarthy attacked. He charged that Marshall was directly responsible for the "loss of China," as China turned from friend to enemy. McCarthy said the only way to explain why the U.S. "fell from our position as the most powerful Nation on earth at the end of World War II to a position of declared weakness by our leadership" was because of "a conspiracy so immense and an infamy so black as to dwarf any previous such venture in the history of man." McCarthy said that "If Marshall were merely stupid, the laws of probability would dictate that part of his decisions would serve this country's interest." When Marshall was sent to China with secret State Department orders, the Communists at that time were bottled up in two areas and were fighting a losing battle, but that because of those orders the situation was radically changed in favor of the Communists. Under those orders, as we know, Marshall embargoed all arms and ammunition to our allies in China. He forced the opening of the Nationalist-held Kalgan Mountain pass into Manchuria, to the end that the Chinese Communists gained access to the mountains of captured Japanese equipment. No need to tell the country about how Marshall tried to force Chiang Kai-shek to form a partnership government with the Communists." Marshall served as secretary of state for less than one year, retiring from politics for good in September 1951. Public opinion became bitterly divided along party lines on Marshall's record. In 1952, Eisenhower, while campaigning for president denounced the Truman administration's failures in Korea, campaigned alongside McCarthy, and refused to defend Marshall's policies. In 1953, Marshall represented the United States at the coronation of Elizabeth II. Marshall married Elizabeth Carter Cole of Lexington, Virginia in 1902. She died in 1927. In 1930 he married Katherine Boyce Tupper. Marshall maintained a home, known as Dodona Manor (now restored), in Leesburg, Virginia. Marshall, "The Organizer of Victory," died October 16, 1959. He is buried at Arlington National Cemetery. There has been considerable comment over the awarding of the Nobel Peace Prize to a soldier. I am afraid this does not seem as remarkable to me as it quite evidently appears to others. I know a great deal of the horrors and tragedies of war. Today, as chairman of the American Battle Monuments Commission, it is my duty to supervise the construction and maintenance of military cemeteries in many countries overseas, particularly in Western Europe. The cost of war in human lives is constantly spread before me, written neatly in many ledgers whose columns are gravestones. I am deeply moved to find some means or method of avoiding another calamity of war. Almost daily I hear from the wives, or mothers, or families of the fallen. The tragedy of the aftermath is almost constantly before me. Material assistance alone is not sufficient. The most important thing for the world today in my opinion is a spiritual regeneration which would reestablish a feeling of good faith among men generally. Discouraged people are in sore need of the inspiration of great principles. Such leadership can be the rallying point against intolerance, against distrust, against that fatal insecurity that leads to war. It is to be hoped that the democratic nations can provide the necessary leadership. ↑ Carl Joachim Hambro, "The Nobel Peace Prize, 1953," Nobel Foundation. Retrieved August 21, 2007. ↑ "George C Marshall: Soldier of Peace," Smithsonian Institution. Retrieved August 21, 2007. ↑ Mark A. Stoler, George C. Marshall: Soldier-Statesman of the American Century (Woodbridge, CT: Twayne Publishers, 1989, ISBN 0805777857), 145-151. ↑ Tang Tsou, America's Failure in China, 1941-50 (Chicago: University of Chicago Press, 1963, ISBN 0226815153). ↑ Ernest R. May, "1947-48: When Marshall Kept the U.S. out of War in China," Journal of Military History 66(4) (2002): 1001-1010. ↑ The Marshall Plan Speech, George C. Marshall International Center. Retrieved August 21, 2007. ↑ Richard H. Curtiss, "Truman Adviser Recalls May 14,1948 US Decision to Recognize Israel," Washington Report on Middle East Affairs (May/June 1991). Retrieved August 21, 2007. ↑ The speech was published as a 169-page booklet, America's Retreat from Victory: The Story of George Catlett Marshall (Milwaukee, WI: Senator Joseph R. McCarthy Educational Foundation, 1985, original 1951). ↑ Joseph McCarthy, Major Speeches and Debates (Washington, DC: Government Printing Office, 1951), 215. ↑ McCarthy, 191. From a speech of March 14, 1951. ↑ Thomas C. Reeves, The Life and Times of Joe McCarthy (New York: Stein and Day, 1982, ISBN 978-0812823370), 371-374. ↑ George C. Marshall - Nobel Lecture, Nobel Foundation. Retrieved August 21, 2007. Marshall, George C. The Papers of George Catlett Marshall. Edited by Larry I. Bland and Sharon Ritenour Stevens. Baltimore, MD: The Johns Hopkins University Press. Marshall, George C. George C. Marshall: Interviews and Reminiscences for Forrest C. Pogue. Lexington, VA: George C. Marshall Foundation, 1991. Available online. Retrieved August 21, 2007. Brower, Charles F. George C. Marshall: A Study in Character. Edited by Stanley L. Klos. Available online from Virtualology.com. Retrieved August 21, 2007. Gullan, Harold I. "Expectations of Infamy: Roosevelt and Marshall Prepare for War, 1938-41." Presidential Studies Quarterly 28(3) (1998). May, Ernest R. "1947-48: When Marshall Kept the U.S. out of War in China." Journal of Military History 66(4) (2002): 1001-1010. Levine, Steven I. "A New Look at American Mediation in the Chinese Civil War: the Marshall Mission and Manchuria." Diplomatic History 3(4) (1979): 349-375. History of "George C. Marshall"
This page was last modified on 13 June 2017, at 21:41.